If you’ve been following this thread, you’ve already seen my solution below to uninstall KB2592687 in order to remove the security error from RDP’ing into a Windows Server. The real issue I was having was that my mRemote client wasn’t passing the “new” control that MSTSC is looking for. The new updated solution (for me at least) was to stop using mRemote and start using mRemoteNG that can be downloaded at this hyperlink. Please note the instructions on how to copy and paste the XML files needed to migrate your old mRemote connections to mRemoteNG. This has stopped the error and you no longer have to uninstall KB2592687 to remove the error. I would allow the process and connect normally. However, this was beginning to get QUITE ANNOYING. I found this blog on CodePlex that summarizes it nicely although it took me a while to find it. 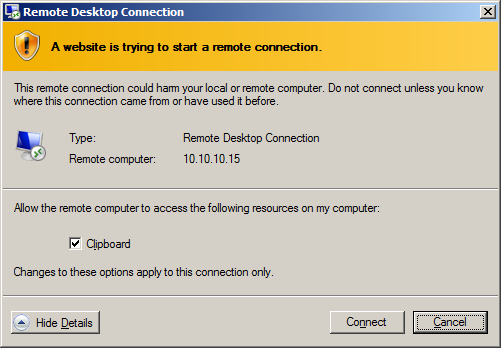 This article discusses the Remote Desktop Protocol (RDP) 8.0 update that enables you to use the new Remote Desktop Services features. These features were introduced in Windows 8 and Windows Server 2012 R2. These features are now available for computers that are running Windows 7 Service Pack 1 (SP1) or Windows Server 2008 R2 Service Pack 1 (SP1). So there you have it. “NEW FEATURE”. I’ve since uninstalled and rebooted and am back to enjoying NOT having that feature. Thanks. This has driven me nuts trying to resolve. In a nutshell uninstall Windows patch 2574819 from Control Panel –> Program and Features. Uninstalling Update KB2592687 did the trick for me. Although this behaviour is understandably annoying, I should point out that KB2592687 is not all bad. Significant improvements were made to RDP8 in the area of 3D graphics and multimedia rendering, and adaptive quality adjustment. In my own testing I’ve found RDP8 to perform in this area way, way better than the prior versions, but to benefit from it on pre-Windows 8 systems you need KB2592687 installed. Of course, this only helps you if you’re remoting to a Server 2012 system (or maybe also Win 8 but I’m not sure). If not, then yeah, go ahead and remove KB2592687. btw I am not affiliated with M$, just happened to research this as we needed to remote 3D & multimedia for a game dev project. Cheers! Just download MremoteNG and all these troubles are history. I have done this and have been using mRemoteNG for the past 3 weeks. It does solve the particular problem – however – there is a weird screen refresh problem when adjusting the size of the mRemoteNG tab. Further, it sometimes locks out the RDP session and I need to wait 60 seconds or so for the RDP sessions to clean up. So mRemoteNG is ok, but trades one problem for another, albeit a much less occurring problem.